Dower chest carved 1948 for Katherine Lord . Who was Nellie Payne? 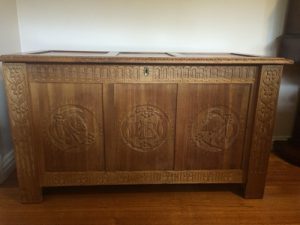 Dower chest for Katharine Lord. Close up inscription inside lid of Katharine Lord’s dower chest. Close up of carving of Katharine Lord’s dower chest. Whilst Atkinson did an outstanding job writing the Ellen Nora Payne book, there is one mistake that has been found whilst undertaking research for this exhibition. 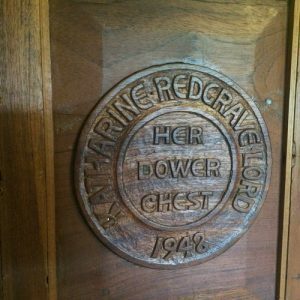 He lists 34 dower chests that Nellie carved – however in this case he lists one being carved for Katharine Lord and one for Mrs Graeme Robinson – in fact Katharine Lord was Mrs Graeme Robertson’s maiden name. Mrs Clarice Robertson (née Walter) was a very close lifelong friend of Madge Payne’s, hence the chest being carved for her daughter Katharine. Madge was Katharine’s daughter’s (Penelope) godmother. This following is Penelope’s recollections. “Mrs Nellie Payne and Madge lived in Antill Street, South Hobart. Clarice Robertson and her family lived a short distance away on the corner of Davey and Darcy Streets. They played bridge together, were on the same charitable committees, and visited each other frequently. I can remember going to visit in Antill St. as a very little girl. The house had the most beautiful antique furniture and we children were encouraged to play outside. On one occasion we were provided with a full-size stock whip and happily spent the afternoon trying to make the whip crack. We failed as I suspect the whip was too long for us, or we were too short for it! Another time we were sent to play in the back room on a wet day and there were beautiful dolls and an exquisitely carved four poster dolls’ bed. It kept us entertained for that visit – playing with these things. Unfortunately on the next visit I succumbed to the fascination of the woodworking bench and the RAZOR SHARP CHISELS. I can personally attest to the strength in Mrs Payne’s hands as she grabbed my arm and pulled me out of potential harm’s way! Mrs Payne always walked around her neighbourhood each day. “Aunt” Madge said she was doing her couple of blocks up to within a couple of weeks of her death. 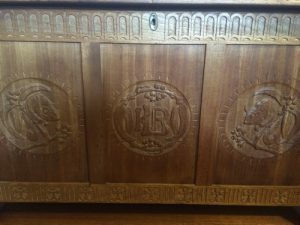 Written by Penelope Hey (nee Robertson), whose sister now has this dower chest in Victoria. 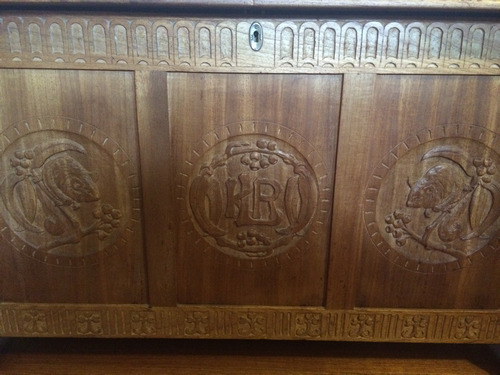 Nellie also carved the Walter coat of arms (DB198), a cabinet (DB197) and a pair of bookends (DB196) for this family.